Have a Question or a Topic you would like covered? ﻿Click the button below to submit your question or idea. 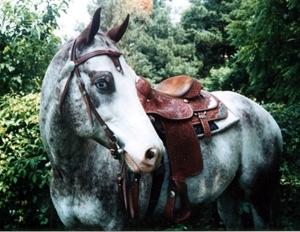 After losing my Bonnie, everyone in the family thought it would be best for my mental health if I got a new horse as soon as possible. Well it didn't take long. All she had to do was give me a kiss and nuzzle my neck and I was hooked. Now understand this, with EPM there is no result of just negative or positive, it is a percentage. According to my vet they don't usually get concerned until there is a result of around 85%. 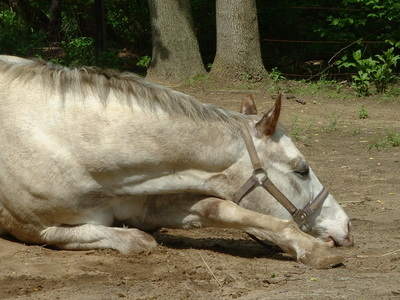 Because my horse was showing neurological signs I went ahead with treatment. I have only been treating her for a bout week now so I do not have any information on if the treatment is working yet. But because of my recent issues with my mare I decided I would share this website that I found during my research, that has a lot of good information about EPM. My mare is showing much improvement on the EPM medication, not only noticed by me and my family but was noticed by both my equine acupuncturist and my farrier. My mare finished a 2 month course of medication and the vet said that should be enough, so far so good. All pigs need to be fed a balanced diet of protein, carbohydrates, fiber, vitamins, and minerals. Pig supplements provide animals with extra minerals, vitamins, and other compounds they may require to meet specific needs. How Much to Feed a PigIf you are raising a show pig, you will have a target weight to reach at a particular date. There is no single answer about how much to feed a pig in order to reach the goal. It is crucial that you weigh the pig each week to make sure the pig is on target, and then adjust the amount of food up or down. If you do not have a livestock scale, you can figure out how to measure your pig's body weight by using a simple formula. Many people believe that the odor of cat urine is one of the most unpleasant smells emitted by any animal. However, the main problem with cat urine is that it tends to grow bacteria, which results in the strong, ammonia-like smell that many people associate with cat urine. To understand the best method to use to remove cat urine, it’s best to first understand where that strong odor comes from, and why your cat may be urinating outside of their litter box. Why does Cat Urine Smell?Many people often ask the question, “Why does cat urine smell so bad?”. Indeed, the aroma of cat urine is very strong, with a distinct ammonia-like smell. This strong smell comes from a special type of protein that is contained in cat urine. When a cat sprays or urinates indoors, this protein is the cause of the strong odor. Why is Cat Urine Difficult to Get Rid Of?Part of the reason why cat urine is difficult to get rid of is because of its strong smell. However, when a cat urinates on a specific area, their urine often forms dried crystals. While you can mask the odor of these dried crystals temporarily with air freshener or carpet spray, the crystals may once again emit cat urine odor when they become moist. In order to fully banish this smell, it’s best if you use a high-powered cat urine odor remover that is designed to neutralize the odor of cat urine. Why do Cats Urinate Indoors?There are many reasons why your cat may be urinating indoors. Some cats may urinate to mark their territory, especially if they have not been spayed or neutered. Other cats frequently urinate when exposed to unfamiliar people or situations. It may even be possible that your cat is urinating in an attempt to get your attention, or if they feel neglected. What Can I Do to Get Rid of Cat Urine Odor?There are many methods that you can use to banish the smell of cat urine from your home. When understanding how to remove cat urine odor, it’s best if you first identify the reason why your cat is urinating. This way, you can prevent future incidents, and lower the chance of repeat cleanups. Mix 1 part water, and 3 parts vinegar. Spray. Let it soak for 30 minutes. Mix 1 cup of hydrogen peroxide, 2 teaspoons of baking soda, and a squirt of dish-washing liquid. Shake it well. Spray, and let it soak/dry. Adjustments can be made for the measurements, to your liking. Update: Bonnie earned her angel wings on March 9th 2017, she is missed by all and will forever have a piece of my heart. So I thought I would take the time this post to introduce you to my horse Bonnie. 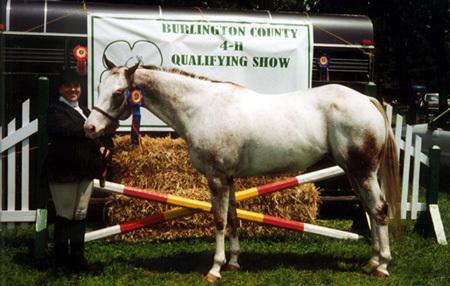 I purchased Bonnie when she was four years old and this year she will be 28 years old. 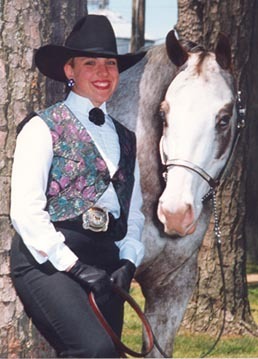 She is trained in all three seats, western, english, and saddle seat. She was an all-around horse, being able to complete in halter, showmanship, hunter in hand, western & english equitation and pleasure, Trail, reining, hunter Hack, and gymkhana. Of course she excelled in some classes more than others. 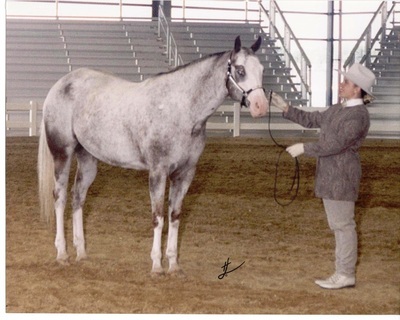 We also traveled to the Appaloosa National Horse Show in Oklahoma twice. 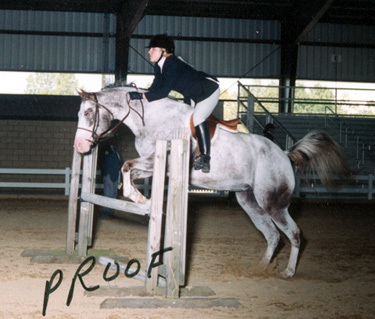 When I went off to college she was partially retired, I would ride and show when I could. She was diagnosed with Cushing's disease a few years ago and now is completely retired due to suffering from a mild stroke last year. She is fine except that she is having a bit of a balance/trust issue with her hind legs. Sometimes she acts like her left hind leg is not there. She receives acupuncture monthly and it helps a lot and do exercises with her to try and get her to realize/trust that the leg is there and she can trust it to hold her up. 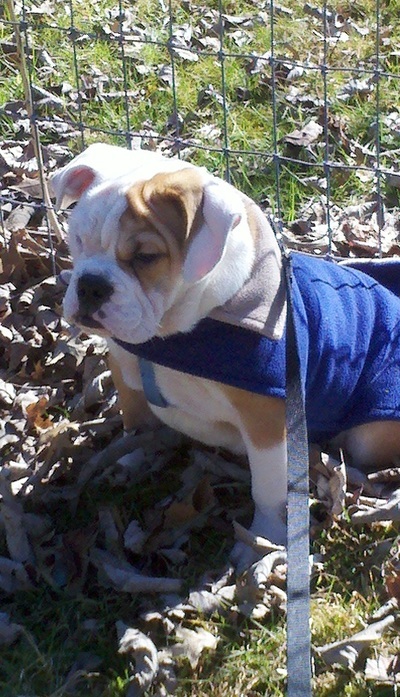 Bonnie will be with me "forever"
Thinking about getting a bulldog or do you already have one? Here are some tips and tricks I find helpful in caring for my bulldog. Baby wipes are your friend. I buy them by the case at the wholesale clubs. 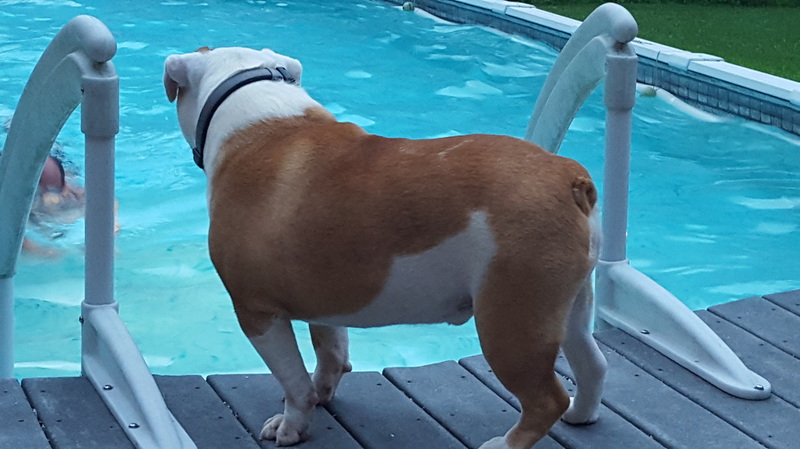 Baby wipes can be used for lots of different things with both pets and children, but I find them most helpful with my bulldog and his tail. Dozer has that typical short stubby bulldog tail, but it is actually crooked and curves to the side. This means that his little tush doesn't stay as clean as it should. I use the baby wipes nightly to clean off the underside of his tail. I will also wipe off his face and his skin folds with them as well. This just makes sure that there is no debris in the folds. 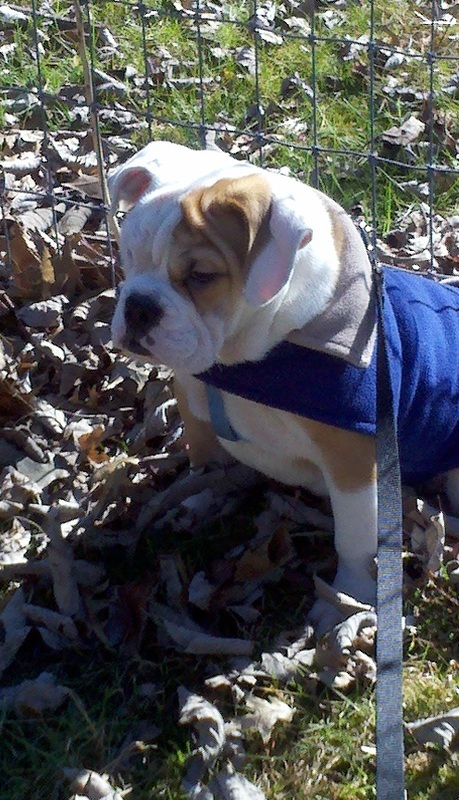 You can also use them as a quick coat refresher if your dog has gotten into some dirt like mine always does. After you have cleansed your pup if you notice any skin irritation, apply some diaper ointment to the areas. 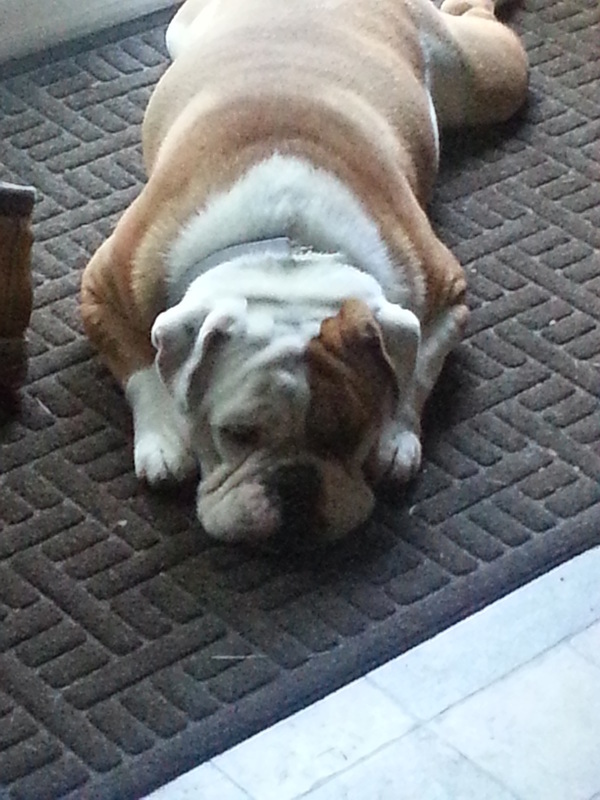 I place diaper ointment under Dozer's tail regularly. He actually enjoys how it feels and will lie down and lift his leg up so I can get in there better. The diaper ointment can also be used under their eyes if their eye tearing is causing more than just staining but an actual irritation. Also use it on the facial skin folds to help prevent irritation from occurring. 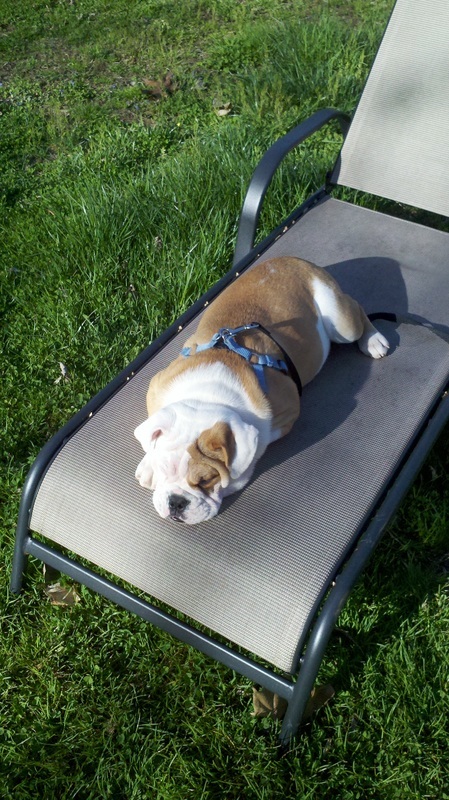 Baby powder can also be helpful if your dog has lots of skin folds that get irritated, but it is not as easy to apply as the diaper ointment. 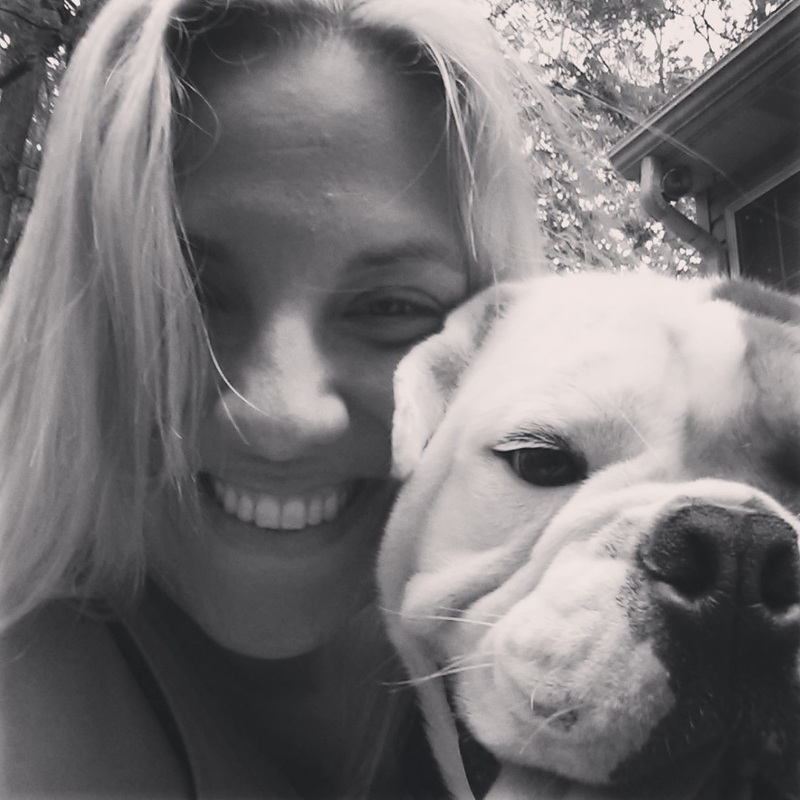 There is some debate as to how often to bathe a bulldog. I say it really does depend on your dog. 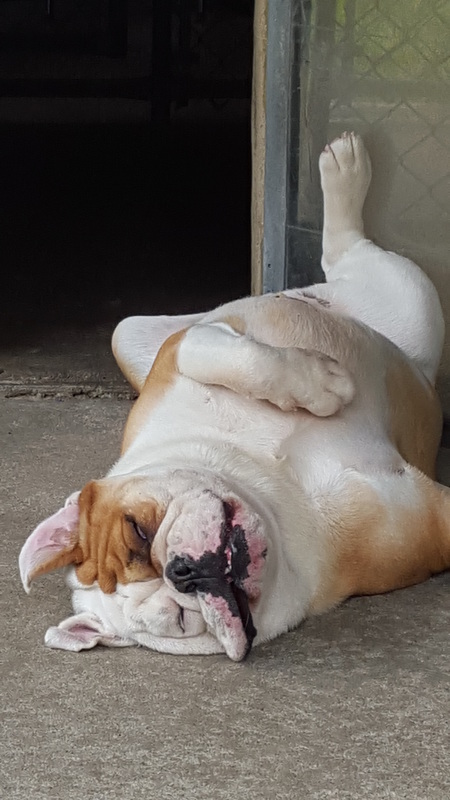 Some bulldogs have skin issues that require regular bathing, Dozer at one time required weekly bathing, we are now down to monthly. If your dog has no skin issues, no dandruff, no itching and stays out of the mud, I would say once a month to once every few months is sufficient. If you dog has skin issues, first and foremost see a vet and make sure there is nothing serious going on. If they are healthy but have dry skin or always seem itchy I recommend a shampoo made with oatmeal or something that is mostly organic. The chemicals in a lot of shampoos can dry the skin even more and cause more itching. I have had many skin issues with my bulldog, all stemming from the demodexic mange he had as a puppy, and I use shampoo from my vet, but you can get similar products (like MalAcetic) from different pet supply stores. Beware that these types of shampoos will bleach your clothes, I learned this the hard way. 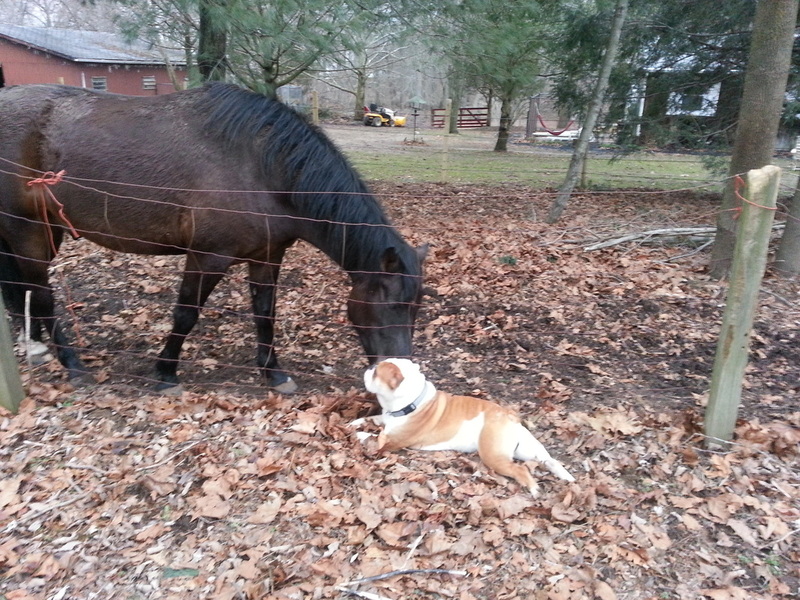 My dog enjoys a good scratch, so when it cam to brushing him he chose one of my horse grooming brushes as his favorite. It's called a dandy brush (stiff bristle body brush) I use it on his body but not his face, for his face I use a horse face brush, which is softer. My bulldog never liked any of the dog grooming brushes the seemed sharp or too stiff and he would flinch when I used them on him. Ear cleaning wipes and tear stain wipes. There are many different brands out there, I prefer the ones from Foster & Smith. I say keep these on hand as they are the easiest way to keep your dogs ears clean and keep the hair under their eyes from staining from their tears. They are simple pre-moistened pads, just wipe and toss. 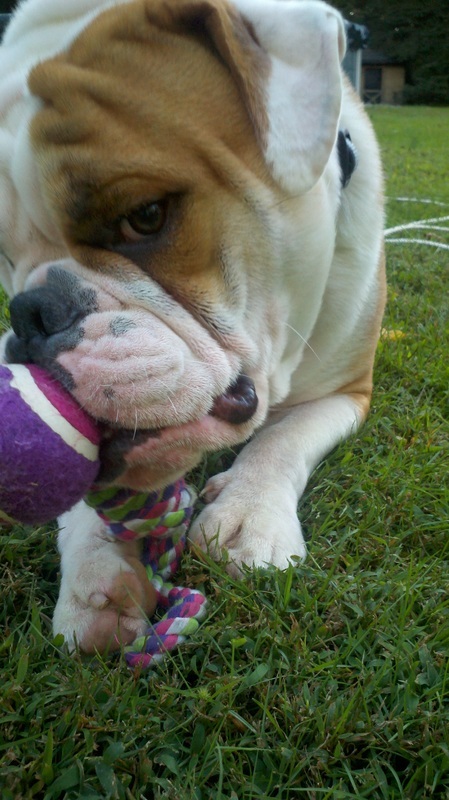 Bulldogs and many other dog love to chew. I have noticed though that bulldogs seems to be able to chew things up that other dogs can not, so here are my recommendations. When Dozer was a puppy he destroyed every bed we gave him, either chewing on it or dragging it around and even taking it outside. As a pup we gave him a large kitty litter pan (never used) to sleep in so he was at least off the floor. He did have a towel to lie on for a little bit, until that became a chew toy as well. 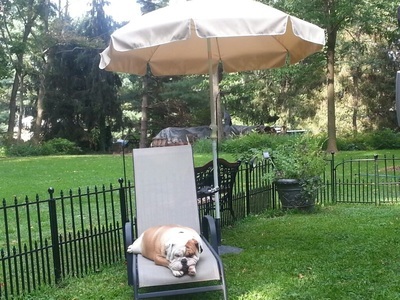 We then purchased a Kuranda bed and it has lasted for years. I bought the strongest one they made. As far as toys went we have gone though quite a few. The larger the better, if the toy is small and he can get his jaw around it, it is sure to die quickly. A favorite in our house is the Nylabone, we chose the ones designed for large dogs over 50 pounds. I would stay away from any of the ones that are called edible, they will last 20 minutes tops and usually cause tummy upset, because they are eaten to fast. As always do not leave your dog alone with a toy until you are sure that they can not tear it apart and swallow things that they are not supposed to. 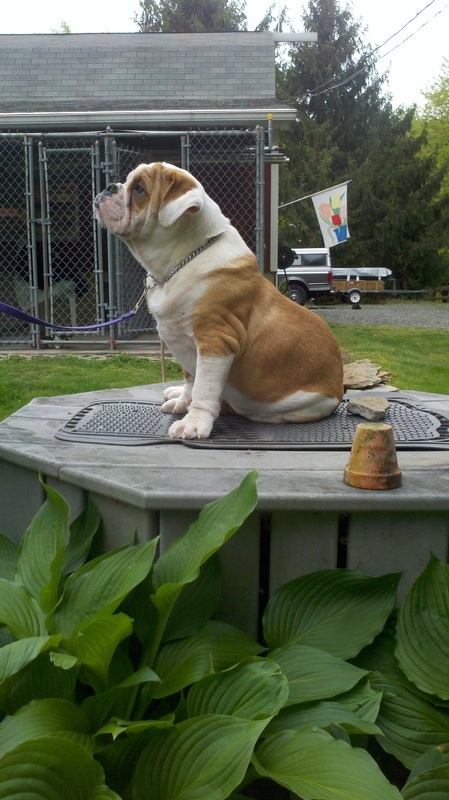 Water bowls can also become toys as well so I use stainless steel buckets to leave water for my dog. When full they seem to weigh enough that he is not interested in playing with it. Have specific questions about your dog just ask, I more than likely have a tip! As I was thinking about what kind of post to write today I realized I have never introduced my four legged kids so today, meet Dozer! 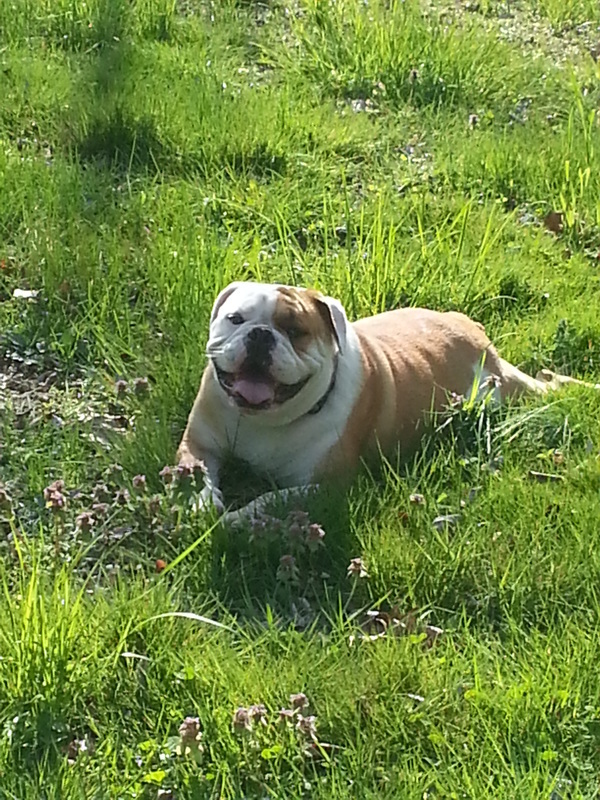 Dozer is a 3 year old, English Bulldog, who I purchased when he was 3 months old. I did buy him form a pet store, which I do not usually condone, due to the fact that most pet store puppies come from puppy mills. Dozer was given to the store on consignment from a breeder who due to the tragic deaths of both his mother and brother ended up with too many litters of puppies. My mother had actually been in contact with the breeder, the day before when she saw an ad in the paper, knowing I was looking for a bulldog pup. 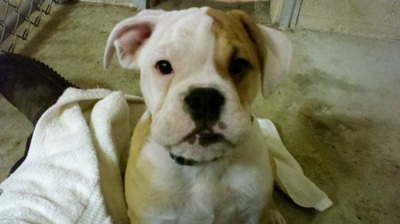 Well Dozer won my heart instantly he is a kisser and a cuddle bug. He loves to be as close to you as he can be, even if that means you can't breath. I am so glad that I was the one who found him in the pet store instead of someone else. ​After taking him to the vet after we found out he had Demodectic Mange and Giardia, both curable but expensive, especially the mange. The reason I say I am am thankful I found him is because I feel someone else may not have put the time and money in to make sure he got the proper care and may have even returned him to the store or put him in a shelter. He is fee of all illnesses, but does suffer from allergies and sensitive skin, but we treat that with children's benedryl. 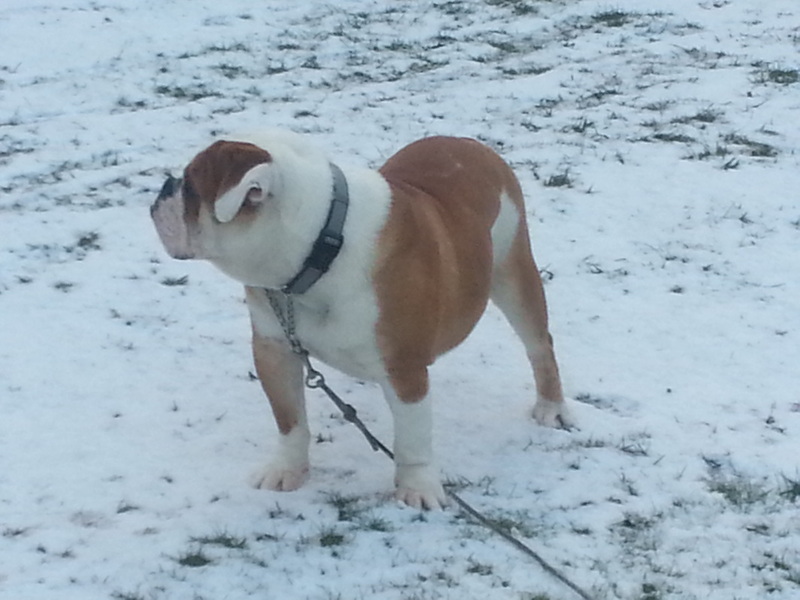 He also has the typical bulldog tummy and feeding him breed specific food has worked wonders. 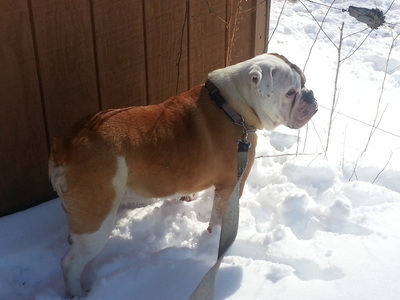 Most recently Dozer suffered an ACL tear in both his hind legs. We opted to not do surgery and took him to My Pets Brace where they showed us why he was getting the tears and how the brace would help him. They also said that they saw a lot of these injuries because of the snowy winter we had, from dogs running through the snow. 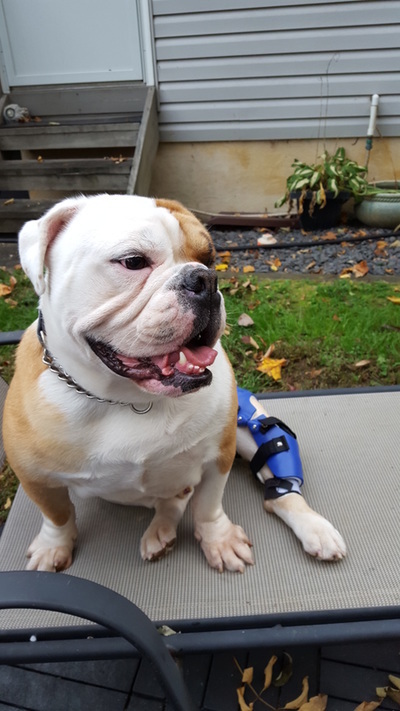 He did have tears in both hind legs but the left leg was worse so it was recommended that we go with the brace on the left leg and then the right leg should start healing itself, with some of the stress removed. I did in fact work, Dozer still wears the brace we we go for walks and play time to prevent re-injury. The brace is the bright blue thing you will see him wearing in the pictures. ANYWAY....even with everything he is a joy and not your typical bulldog he actually prefers to run and go for walks then lay around. He is what we call a busy dog, always doing something. The pictures you see of him lying down, that lasted about 30 seconds. He will put anything in his mouth, thankfully he learned a few commands early that help with that like, leave it. I own a 27 year old appaloosa mare. I have had here since she was 4 years old and she is my world. As she has gotten older we have started having some difficulties with her. 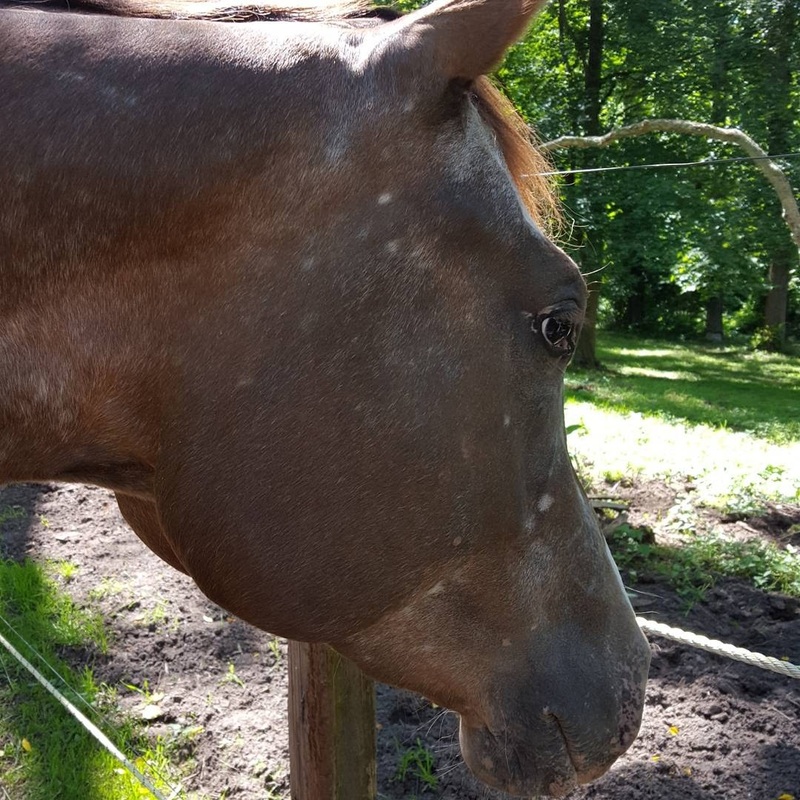 First she was diagnosed with Cushing's Disease, for those of you that do not know what that is, it it like diabetes for horses and she has an intolerance to sugar. Second this past year we noticed that she seemed unable to walk straight, her front end would go one way and her hind end would go another, and she was leaning constantly on things, including me. I called out the vet in a panic and he almost instantly new what the problem was. She had suffered a stroke. 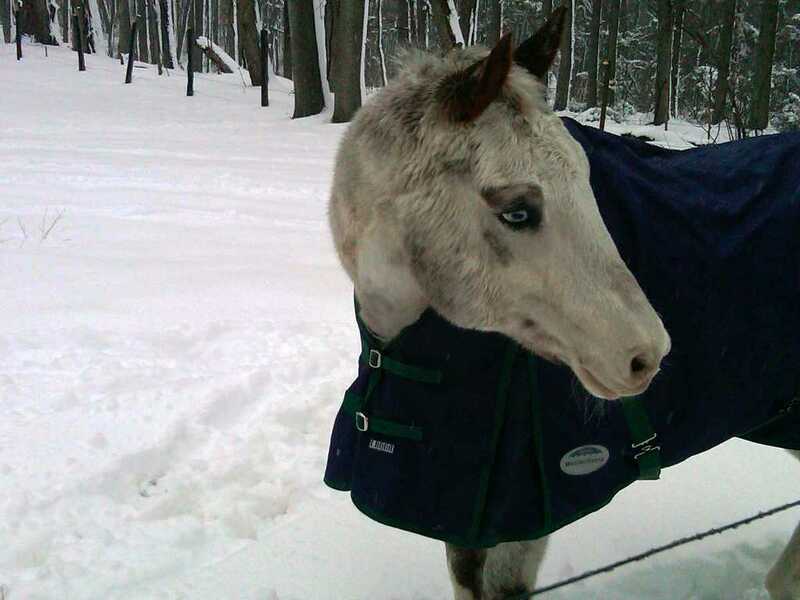 She is doing well, especially with seeing an equine acupuncturist every month. One problem that seemed to develop was that she no longer liked to eat. She has always been picky so I assumed it was just a phase, as she seemed to be okay with her eating her hay. Weeks went bye and we still were not getting her to eat but a few nibbles out of each meal. I tried breaking down the meals so that she was getting fed multiple times a day instead of here usual two times. That seemed to work for a minute. Since she got fed three different types of grain I tried weeding out certain ones to see if that made a difference, again that worked for a very short time. 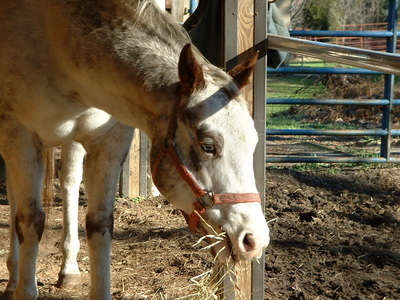 I was trying everything I could think of I would add bran both dry and wet and hay cubes, dry and wet. Nothing worked for more than a day or sometime even just one meal. While talking to my neighbor at the fence one day she told me she bought this feed to try with her horses, but upon reading the label more realized it was not for them, it had to high a fat content. She asked me if I wanted to try it for my horse since it was labeled to be good for older horses, had a low sugar content and a lot of other things that sounded just right for my girl. So I grabbed a bucket and walked with her down to her barn and filled it up. We walked back up to were all the horses were hanging out together and I put the bucket under my mares nose and she began to eat immediately. OH MY GOSH...I was so excited I could barley contain myself. I just kept praising my mare for eating. She ate quite a bit and then stopped but, would come back and nibble now and then. I was shocked. I continued to feed her this new grain for the next few days and her bucket was empty every morning and night. It is a Blue Seal feed called Sentinel Senior. 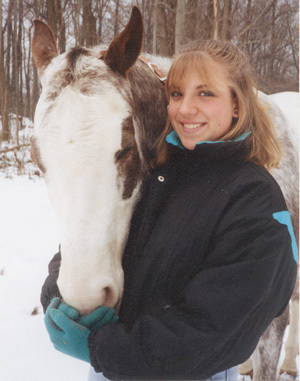 horses, prematurely aging horses or horses with poor teeth. Sentinel™ Senior is a highly fortified balance of nutrients and an exclusive blend of natural additives to meet the increased nutritional demands of the senior horse due to less efficient digestive and metabolic systems. 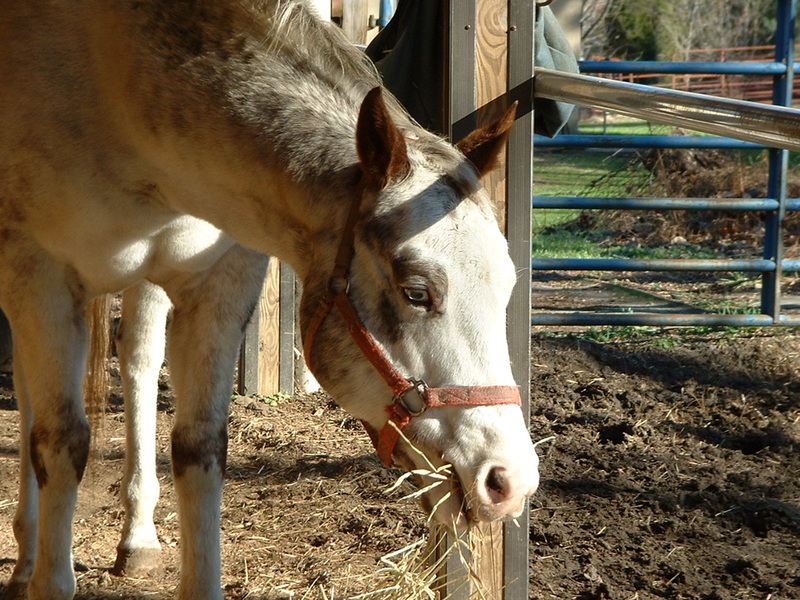 provide essential nutrition and calories to senior horses, prematurely aging horses or horses with poor teeth and is easily digested for optimal nutrient utilization." It is a lighter, softer pellet that does seem much easier to chew and it has a pleasant smell with out being a super sugary feed. I don't usually like to do specific product posts but this feed has been a life saver and I wanted to share it. I have a none horsey husband, he is learning, but there is still a long way to go. Once blanket season hits every morning he asks "Do I leave the blanket on?" 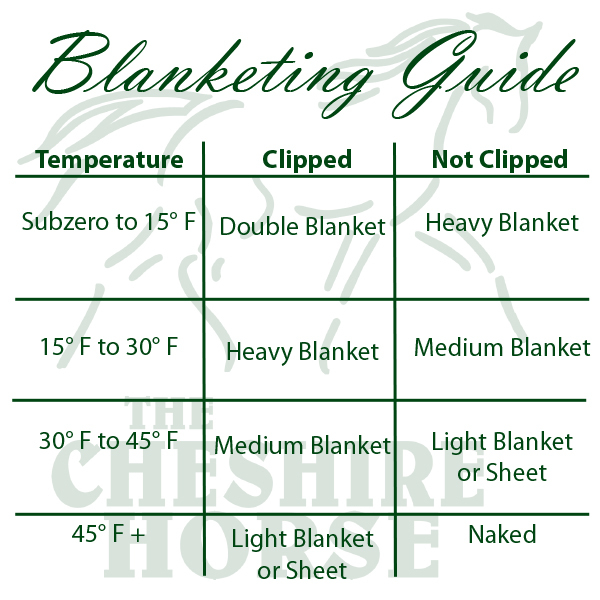 So I found this handy chart from The Cheshire Horse that I printed out and have in the house and the barn from him to reference. I also make sure the blankets are labeled so he knows which ones are which. If your like me, and many others out there with barns you have, "Barn Cats". Now just because they are barn cats doesn't make them any less a part of my furry family. In fact my Oreo and Tootsie would love nothing more than to join me in the house. Every time the temperature starts to drop people ask "What are you going to do with the barn cats?" Well as much as I would love to bring them in when its cold, I can't. They have no home training, meaning my house would be torn to shreds as they are used to climbing, jumping, and scratching on what ever they want to. Plus my 11 year old mainecoon who is very possessive of his mamma might have something to say about it. 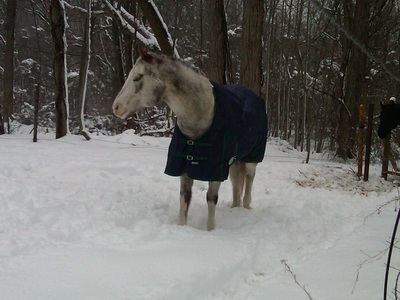 So here are a few things I find important for my barn kitties in the winter. 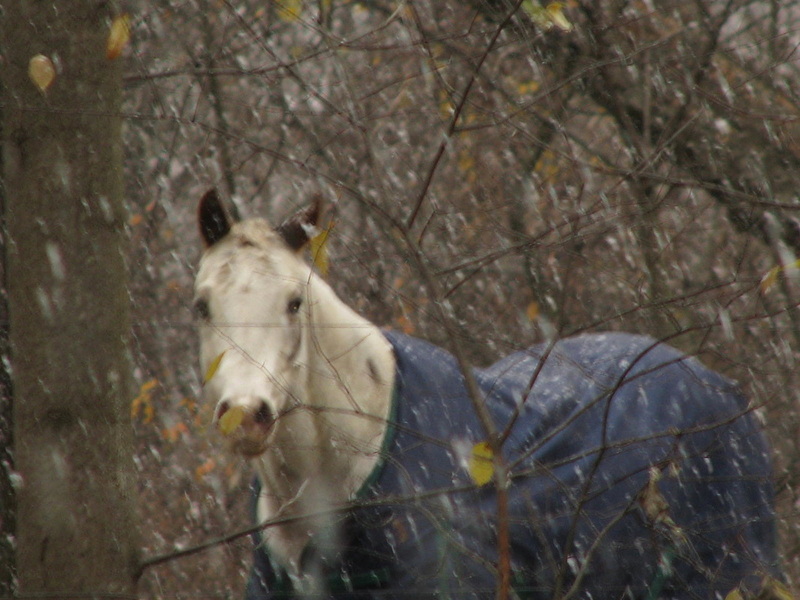 All animals need food and water, even in the winter months. Make sure that their food bowl is somewhere where it won't end up buried in the snow or frozen solid because it rained. I have a cat door installed in the wall of my barn that leads into my tack room where I keep my cats food. For those of you that don't have that ability or aren't comfortable with cutting holes in walls. I have found that something as simple as buying a large plastic tote and setting it on it's side, can be helpful. If you have multiple cats I woulds suggest multiple feeding locations since some cats just are not comfortable in tight spaces with others. If you want to take it up a notch you can even attach the lid to the side of the bin creating a little over hang. This also helps weigh the bin down a little bit. As far as water goes the best thing to do is invest in a heated water bowl, even the bowls placed inside my tack room freeze overnight when the temperatures drop below freezing. You can find them at your local farm supply stores or online from most pet stores. If you can't find the heated bowls, you can just buy a heated bed and either place the water in it or right next to it and this will slow the freezing process. The only down side to both of these options is that these must be near an electrical outlet. Fortunately cats are survivors and if you have to move the water they will find it. I had a stray cat that showed up at my barn who learned how to drink out the horses heated water trough in the winter. If purchasing a heated bowl is completely out of the question here are a few tips for keeping you cat hydrated. Put a little water in their dry food, it will freeze eventually but if they eat it fairly quickly you are helping them get the water they need to stay hydrated. ​Add a bit of oil, sugar or salt to their water. This will stop the water from freezing as fast. If you live in a climate that rarely dips below freezing, keeping your pet's water in a Styrofoam container or cooler this will help it stay above its freezing point. This can be a little tricky, especially if you have multiple cats that need warm places to sleep. Again a cat door into your barn or tack room where they can sleep out of the elements is best but not always an option. You can of course by outdoor pet houses but, that can get expensive. 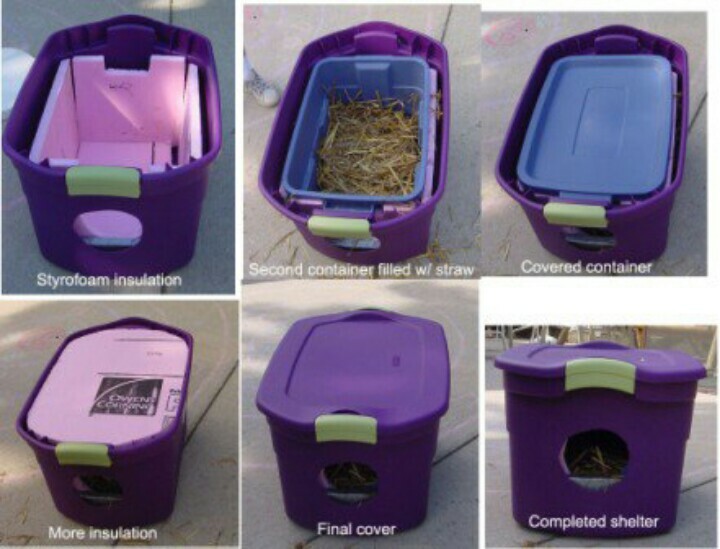 There is a pin on pinterest that pops up all the time, especially as the temperatures drop, on how to make an insulated cat house using plastic storage bins I think its a great idea so I have posted the picture below. This is not my idea, but I do not know the origin of who posted it. Hay is a great insulator. If your cats have access to your hay storage then I would not worry about creating them anything to sleep in. The hay will keep them warm. My cats often choose the hay over the heated house my father built for them. If you don't want to do anything this complicated, just make sure that your outdoor cats have a place to shelter out of the elements. Something as simple as leaning an extra sheet of plywood on the side of the barn can be helpful to your cats. Visit Hooves's profile on Pinterest.